I have been very blessed to have an employer who regards education very highly. After receiving a Bachelors Degree, I was able to receive two Masters Degrees, one in a traditional brick and mortar institution and the other online. Each means of education has their benefits depending on the amount of time you have available and other commitments. For many people, a traditional nine to five university education will not fit into their lifestyles or careers later in life. For those individuals, an online education may be the perfect fit. GetEducated.com is an excellent website that has a wealth of knowledge about finding the right college to fit your needs. GetEducated.com is the only consumer advocacy group in the United States dedicated to assisting online students in analyzing, comparing, rating, and ranking online colleges and universities. One of the best features of the website is that it does not try and sell you a particular program. GetEducated.com gives you impartial, straightforward information about college programs regardless of affiliation, advertising, etc. Unlike other “online degree directories,” GetEducated.com is staffed by higher education experts who evaluate, screen, filter, and analyze each school that applies to be included in their online education directory. GetEducated.com also helps educators find employment with online colleges. And, the website actively reports on “Diploma Mills”, keeping students informed about which colleges they should probably stay away from. The website has a database that documents consumer alerts on more than 300 fake online colleges and university scams that run rampant on the internet. Remember to always look for accreditation…. 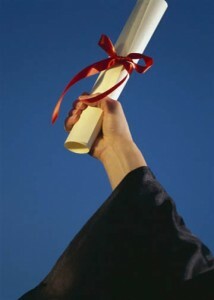 You do not want to get a degree that future employers or other colleges view as worthless. To ensure that your education is a good one, you must only enroll in accredited colleges and universities. Accreditation provides for the independent review of education programs for the purpose of determining if that education is of uniform and sound quality. But, which ones are good? In the United States the most widely recognized form of university accreditation comes from the regional accreditation boards. For example, Harvard University is a regionally accredited university. There are also national accreditations as well. For more information, I highly recommend staying “in the loop” with GetEducated.com’s great monthly online newsletter. You can sign up for it at their website.